Regal Electronics Introduces Low Profile Metal Body Dual-Stack “Mini” BNC Connector | Regal Electronics, Inc.
Sunnyvale, CA — Regal Electronics has added a new low profile metal body dual -stack mini BNC connector to its product line. Regal’s new RoHS compliant connector improves upon the space-saving efficiency of current stacked designs by decreasing the spacing between the ports and minimizing overall height. The connector builds upon the proven reliability of the time-tested BNC configuration, with it’s twisting “snap -lock” design. The new “mini” connector is especially good for ever-shrinking test equipment, lab instrumentation, radio frequency patch panels, and broadcast and surveillance video applications, where a strong, reliable physical connection is required in a tight space. 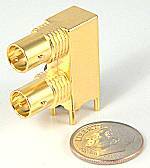 The new Regal BNCM31202-LM-75R connector has a gold plated metal body for strength, shielding, and reliability. The operating frequency range is in excess of 1.5 GHz and impedance is 75 ohms. The connector is of the classic through hole/PC mount configuration, and has sturdy solderable mounting tabs for strength and connectivity. Since 1976, Regal has manufactured quality electronic components, speakers, connectors, and a wide variety of related products and services from its operations in the United States, China and Taiwan. Engineering support for Regal Electronics, Inc. line of products is located at its Sunnyvale, California, headquarters. More information may be found on Regal’s Web site: www.regalusa.com.